Jonathan Bishop had been paragliding across the southeastern part of the country for about two hours when he began descending at the Orroral Valley tracking station, a NASA station that supports Earth-orbiting satellites 50 kilometers (31 miles) south of Canberra. Recording his landing with a helmet cam, Bishop says the landing pad was the last cleared valley where he could safely land. 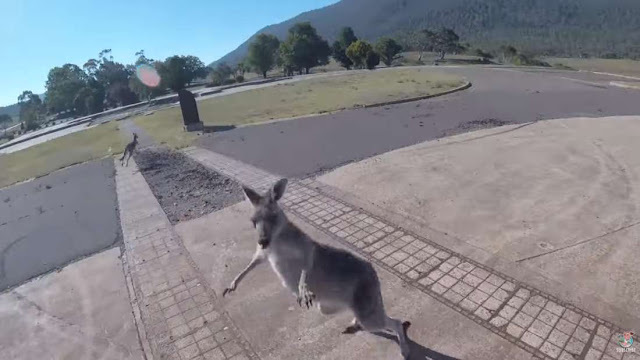 “I was concentrating on the landing and didn't notice the kangaroo until after I landed,” he wrote in a description accompanying the YouTube video. That’s when the overly aggressive Kangaroo bee-lines straight for the paraglider with what we can only assume is absolute fury in his eyes. The marsupial then squares up with a stature that would make Mike Tyson proud and jab, jab, power hooks Bishop. “As it ran towards me I thought it was being friendly so I said 'What's up, Skip?' It then attacked me twice before hopping away,” he said, adding that he then packed up his paraglider and had to walk several kilometers to get phone reception and call a friend to pick him up. The now-viral video has since been viewed more than 1 million times. A large male kangaroo can reach heights as tall as 2 meters (6.5 feet) and weigh up to 90 kilograms (200 pounds). Though an attack by one may seem funny at first, it can quickly turn dangerous. The four species of kangaroos are all endemic to Australia, and their population doubles that of humans with an estimated 50 million across the continent. The iconic national symbol is mostly now considered a pest, from damaging crops and threatening the agricultural industry to their involvement in more than 80 percent of vehicle-animal collisions every year, National Geographic reports. Human growth and development continues to encroach on wild environments, butting people and wildlife against each other and creating, in some cases, potentially life-threatening situations. Last fall, an Australian couple feeding wild kangaroos on their property was attacked by a kangaroo only to be rescued by their son, who hit the kangaroo with a large piece of wood. Similarly, a dramatic video released in 2016 shows the moment an Australian hunter punched a kangaroo in the head to save his dog who was trapped in a headlock. “F*cking Kangaroos,” Bishop ends the video.